If you don’t have an up-to-date view of the needs of your key customers – at a deep level – it can be hard to expand your key customer relationships today. If you are looking to move “upstream” and get more involved with customers in terms of marketing services, creative work, mission critical applications and business processes, the question is: Have you had “The Talk” with your customers? If you don’t have an up-to-date view of the needs of your key customers – at a deep level – it can be hard to expand a business relationship today. And, if you are like a lot of your peers, you may be looking to move “upstream” and get more involved with customers in terms of marketing services, communications strategy, creative work, mission critical applications and business processes. So, have you had “The Talk” with your customers? It’s that talk where you uncover what they love about you, what they dislike and whether they can envision you providing new and different services. The talk where they reveal what’s important to their future and what makes them feel vulnerable. The conversation where they share their most important personal agendas and their company’s most important initiatives. If you are planning to diversify, add new services or just look to grow your customer base, you need a strong sense of the things your key customers value. You need to know how they feel about you, your company and your services, today and moving into the future. Now, I am pretty confident that most of you have these types of customer conversations on a regular basis. Some do it informally, in a piecemeal way, catch-as-catch-can. Others have a more formal feedback system they employ to insure they are in step with their customers. I invite you all to share your own suggestions and experiences by adding a comment at the bottom of this article. The purpose of this article is to take a step a back and give you some ideas, some checklists and some probing techniques so you can take a fresh look at how you’re soliciting and incorporating customer needs in your business. 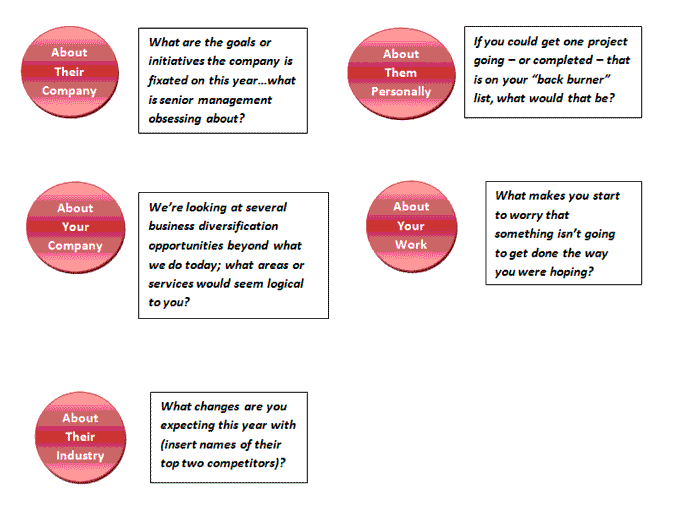 The chart below outlines five useful steps in planning and carrying out a productive and enlightening conversation with your key customers. We’ll tackle each step in a bit more detail with some tips and reminders and questions. It is hard to overestimate the value of being current with everything happening with your customer and their company before you visit. Having spent over twenty years in the advertising and direct marketing agency business, I always tried to uncover some things about a client that they may not have heard. Or, I wanted to be sure I knew what the hot topics were inside the company. 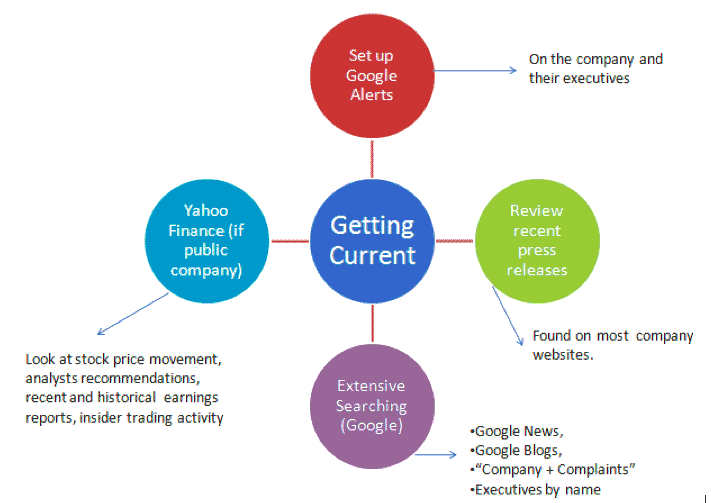 If the company is gripped in a crises, part of a takeover or was just featured in a high profile article, knowing what’s happening allows you to converse on a much higher, strategic plane. 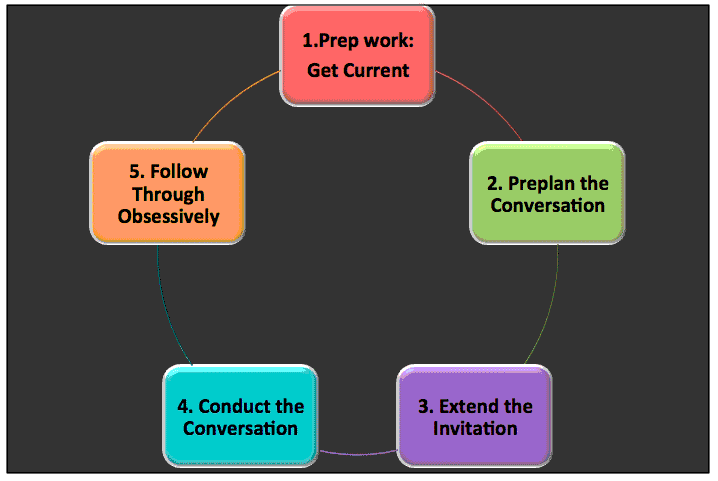 See the chart above for some tricks and tips to get current before you have your talk. The next step in the process is to plan out the conversation. 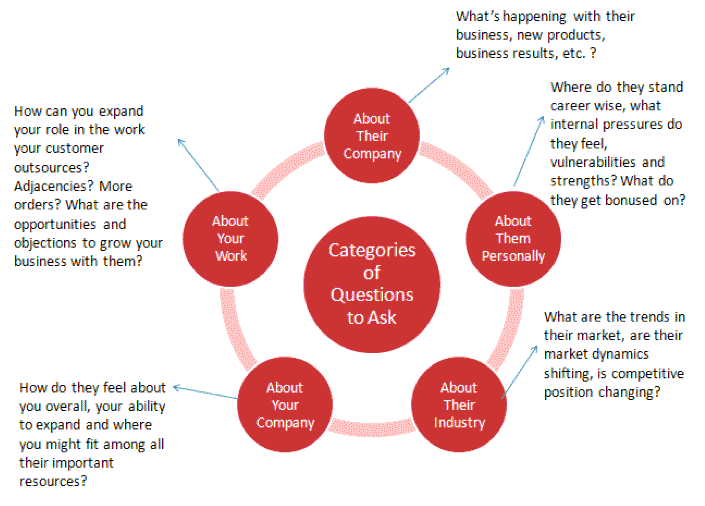 Consider the chart above as subject headings…areas you’re looking to gather insight on needs. It isn’t uncommon to accomplish this over more than one conversation. We’ll have some sample questions later in the article. 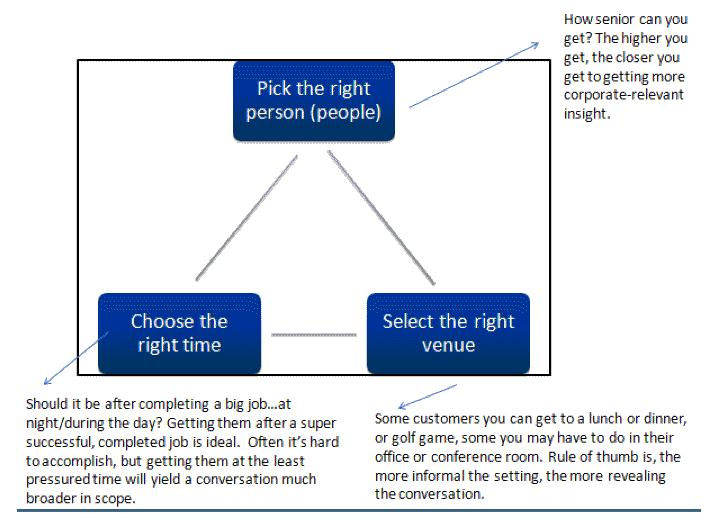 Getting the right people, place and time are crucial to a successful customer strategy session. In today’s break-necked-paced world, pinning people down and getting them to set special time aside for you is hard. I can tell you from practical experience; IT IS WORTH IT. Getting clients to relax, feeling comfortable and made to feel important are all important elements to be successful here. One way to conduct this conversation is to ask very straightforward questions, like, “what do you like best about us”, or “what would you like us to change about the way we do business”. I’m not usually in favor of indirectness when it comes to important meetings, but I would argue in favor of open-endedness and rounded edges in your questioning. You are looking for the answer behind the answer…the feelings that aren’t typically volunteered. And you might not get to the deeper needs unless you probe for them. A good blog post I found has some insight on how to uncover deep needs can be found here: http://www.bnet.com/blog/salesmachine/how-to-uncover-customer-needs/98. Among the guidelines, there are great ones like: Have a conversation, not an inquisition. Or, this one: Ask leading questions in the abstract, where he advises to avoid asking things like “what would make you buy this new product from us”. If you could change one thing about our relationship, what would it be? What would you type into Google to find a business like ours? What is the one thing that, if it were removed from your “to do list”, would create more time for you to think and handle more important things (be ready with suggestions)? Find or create an unusual and memorable thank you gift; do something creative so it really has impact. Document the outcome from your meeting and share it with your management team and department heads; work hard to capture the subtlety that might have come through in discussion. After making a decision on new services -- or how to expand -- or areas you’ll be improving -- send the follow up note to the customer and let them know they helped inspire the change inside your company. Repeat the process – having “The Talk” annually at a minimum, preferably every six months. Good luck on your customer needs probing and insight collection…and remember to share any ideas or success stories you have on the topic by leaving a comment below.